John "Amos" Morgan was born in Lydney in the Forest of Dean in rural Gloucestershire in 1941 (which makes him younger than Tommy Banner and Pete Budd!). The son of a Forest miner (a traditional occupation almost an ancient as Forest! ), he became an apprentice electrician when he left school. But it was music that fired the young Forester's enthusiasm. As a schoolboy he had learnt to play the drums, and had been drumming with various local bands through his youth. In 1962 he got his big break. He was spotted by a BBC radio producer called Brian Patton (hopefully not 'THE' Brian Patton, brother of the Chuckle Brothers!) who employed him as drummer for the house band at the BBC studios in Clifton, Bristol. This was in the days when live music - not records - was broadcast to listeners - and so, at the tender age of 21, the young John Morgan became a professional musician! He became a drummer in demand, playing in dance halls and venues across the country - including the prestigious Empire, Leicester Square in London. He worked at Mecca for a decade, did the odd season at Pontins Holiday Camp, and filled his diary with session and live work for the BBC. During that time he worked with many of the big names in the music industry. By mid-1970, he was a member of the Best of British Showband who were managed by John Miles, The Wurzels manager and promoter at the time. The showband were used by The Wurzels to provide extra instrumentation at the larger gigs during their chart-topping 'glory days' (or should that be 'Morning Glory days'?). In 1981, with work drying up at the BBC, John was advised by Brian Patton to have a chat with John Miles about becoming the Wurzels full-time drummer. One interview, and a totally new wardrobe, later and he was a Wurzel; and he has been hogging the drum stool ever since. Although Tommy and Pete are the distinctive faces of the band, John Morgan's tea-sipping, ever-smiling face has been a cornerstone of the band for well over two decades. John still lives in the Forest Of Dean in Gloucestershire. In an interview with Paul Gunningham for Wurzelmania! in 2001, he explained that he likes all kinds of music and his first love is brass band music. He's a keen follower of sport, in particular watching soccer, cricket and rugby. 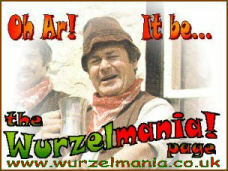 John's favourite Wurzel songs are The Cabot Song (Big 'Ead) and Drink Up Thy Zider. In the Wurzels World book, he also admitted to having a love of the countryside, and a large menagerie of pets!